Unknowingly… I couldn’t think of better start. Thinking is a mystery process. It can create beautiful things. When done wrong way it can create things like what you see in this blog. The Nonsense. We start thinking of something. The process of thinking starts and it finishes when you reach to a conclusion which you think is it’s end. This simple process is very complex but we do it unknowingly. Have you noticed Windows, the OS you always curse. It’s got a progress bar when it’s loading. It is processing in background and in the end it renders a beautiful interface with which you can interact with computer. As a Windows user you must have gone through a phase when it gets stuck at the loading phase. The progress bar keeps scrolling horizontally bringing all the bad words you ever know for Bill gates. Irritation. Similar happens when you think. The progress bar gets stuck and in return you are stuck. You get confused. You are body less person. You are only head now which like surrounded by five brothers of your girlfriend punching you. Nothing else feels other than your head. 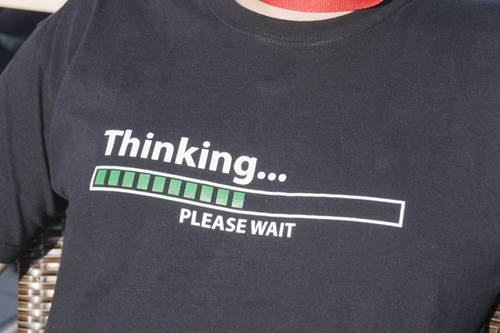 The best part is, you have to think on how to stop thinking. Some more punches. Your head is size of pumpkin about to burst. What to do then? Just find the body and rest the head on it. The pain will get transferred to the body and you’ll get relief. The progress bar moves ahead ready to render fresh thoughts. I am going through the same phase and it’s my personal experience. Just use extra weights in your gym and see this thing working. I got a relief from all the thoughts fired at me from all direction. Not just quiet ready to think what I love to think. But that should not stop you from thinking. What are you thinking of?? obviously like your website but you have to check the spelling on several of your posts. Several of them are rife with spelling problems and I find it very bothersome to tell the truth nevertheless I will surely come back again.